Sun-Young Kang received a BFA in Korean Painting from Ewha Woman's University. After working briefly as a children's book illustrator and designer, she moved to the US and earned an MFA in Book Arts/Printmaking at The University of the Arts in Philadelphia. Sun Young Kang: "My working process is always repetitive, to represent every single moment as a timeless space in between absence and presence, as well as providing a visual/invisible concept of their interrelationship. The effect of light and shadow, and the delicacy in the strength of thin paper are most commonly used in my work as a metaphor of the inseparability of life and death, as well as an installation device to create two conceptual spaces-one side and another in the same space." By Sun Young Kang Buffalo, New York: Sun Young Kang, 2018. Edition of 20 + 1 AP. Size: 85” x 5” x 3” open; 3” x 5” x 0.5” closed. Accordion structure. Two layers of paper: one of text and one as protection of the back side of the sewn text. Embroidery using artist’s own hair on handmade Japanese paper. Materials: hair, Japanese paper, museum board, transfer print. 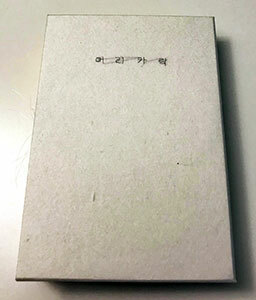 Text in Korean with English translation on the colophon. Signed and numbered on the colophon by the artist. Sun Young Kang: "Shed hair is no longer physically part of me, but it still contains information (genetic, protein, etc.) that are specifically myself. The only difference is in the loss of physical connection. This piece questions how this common thinking reflects how people relate/connect to each other. As a person who always feels living in between two cultures feeling forever outsider in either place, this thought also reflects how immigrants are often separated from their families, so that emotional connection is weakened or even lost over time and the people become more isolated from their homeland that way." Philadelphia, Pennsylvania: Sun Young Kang, 2011. Edition of 10 + 1 AP. 3 x 2.25"; 27 pages. 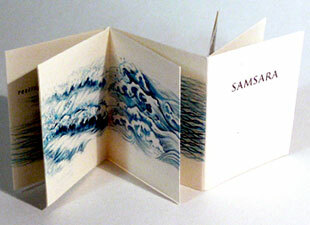 Accordion fold from back pastedown. Shadow book. Paper cutting. Colophon on back pastedown. Paper-covered boards with cutout door designs in matching paper tipped on. Thread and button closure. 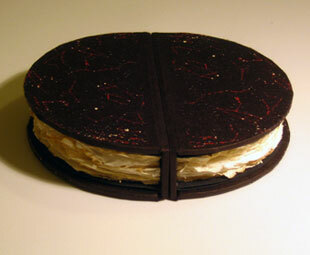 Laid in archival phase box with velcro closure. 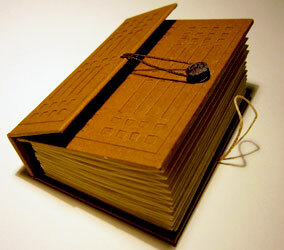 This is a shadow book meant to be read under a lamp or spot light in a dark space. 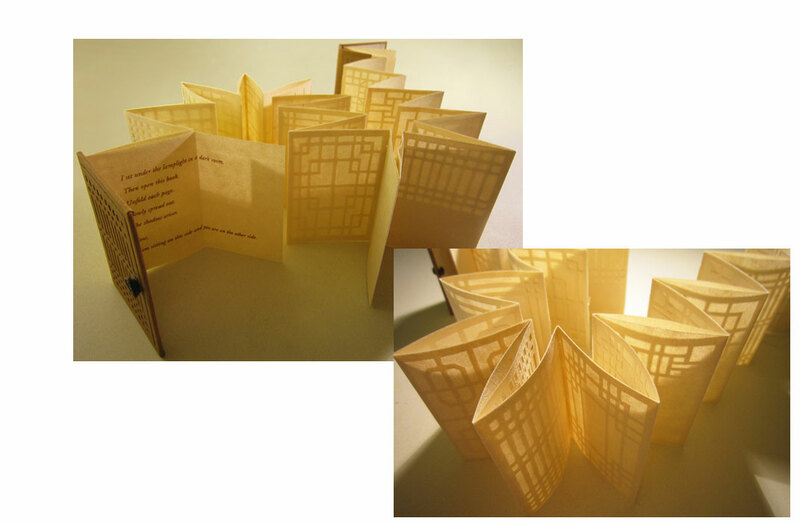 Sun Young Kang: "I have created this shadow book with paper-cut-out images of Korean traditional doors. The process of cutting the pattern of the doors to create shadows recalls my memories of my grandmother in her old house. When I was inside, I could see the shadow of Grandmother cast on the paper doors from outside. Grandmother's presence as a shadow on the door has remained a strong image in my mind. Unlike many other doors, the traditional rice paper door does not totally block the inside and out from each other. It only creates the concept of this side and the other while simultaneously connecting them to each other. 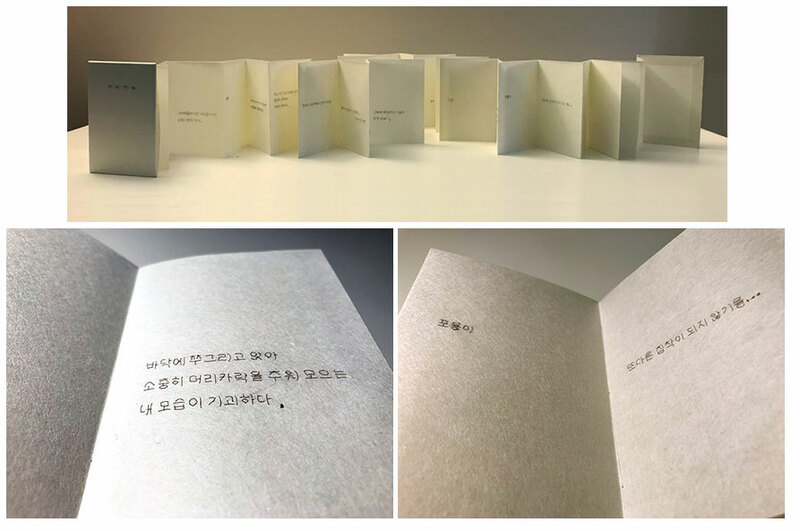 When this accordion book is unfolded, the pages are shaped as closed, connecting the memories of my Grandmother, who is now in the other side, with myself in this world." Philadelphia, Pennsylvania: Sun Young Kang, 2005. Edition of 400. 1.75 x 1.375"; 12 pages. Miniature. Inkjet printed with hand drawn images. Modified dos-dos structure. One sheet folded to form 12 pages. From the book: "The material world was a place fragmented and constantly changing; this changing aspect of the universe came to be called samsara." Wikipedia (5/3/12): "In modern parlance, samsara refers to a place, set of objects and possessions, but originally, the word referred to a process of continuous pursuit or flow of life. In accordance with the literal meaning, the word should either refer to a continuous stream of consciousness, or the continuous but arbitrary drift of passions, desires, emotions, and experiences." Philadelphia, Pennsylvania: Sun Young Kang, 2005-2009. Edition of 10 + 2 AP. 1Two books: 4.5 x 2.25"; 52 pages. Hand drawing. Computer-manipulated and inkjet printed photograph. Handmade paper for text block. Boards covered in Korean Warahani paper with inkjet printed image. Case bound with optic binding. Sun Young Kang: ""The name Man-Byul, meaning 'thousands of stars' in Korean, was created by combining the first and last syllables of Man-Nam (meeting) and Yee-Byul (farewell) respectively. Man-Byul is the story of our life, combining both the happiness and joy of 'meeting' with the inevitable sorrow of 'farewell'...."
"Korean has syllables like English but [they] can be separated and still readable. And each syllable doesn't always have meaning like Chinese but it is still readable and understandable when separated in order....I actually used this trait of Korean and separated all the syllables and repositioned them to use each syllable as an image. So each syllable is a Star in this book. Then I connected each with the pencil line to provide the original order and also to make a constellation. So, if you are a Korean speaker and if you read each syllable in the order, you can read and understand.... But if you just look quickly without knowing the meaning, it is more like images than word. "Each page normally has one phrase of one short sentence. "Each of the two volumes can be separated as meeting and farewell respectively, but they are originally together and become another circle again. I believe that our life is composed with two ideas, which are meeting and farewell, birth and death, happiness and sadness and etc."